That same day in the evening Metropolitan Hilarion attended a dinner in the ‘Intercontinental’ hotel given on behalf of the Interparliamentary Assembly on Orthodoxy (IAO). Attending the dinner were also His Holiness Patriarch Bartholomew of Constantinople, His Beatitude Patriarch Theophilos of Jerusalem, His Beatitude Archbishop Chrysostomos II of Cyprus, His Beatitude Archbishop Hieronymos II of Athens and All Greece, His Beatitude Archbishop Anastasios of Tirana and All Albania, bishops and clerics of the Local Orthodox Churches; the IAO President, Mr. Sergei Popov of the Russian State Duma; Mr. Sergei Scheblygin of the Russian Federation Council; Mr. Valery Alexeyev, President of the International Foundation for the Unity of Orthodox Christian Nations. 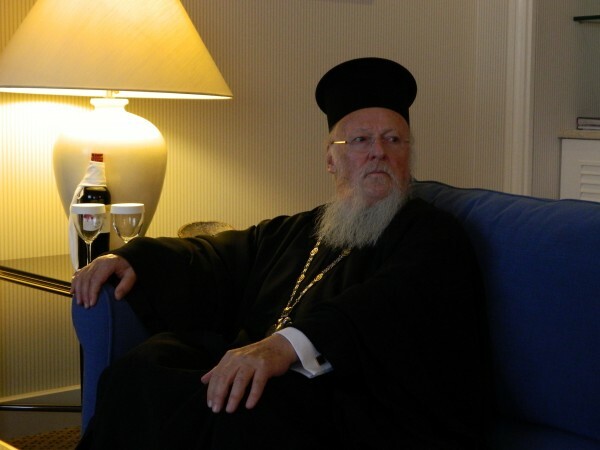 In the morning of October 19, Metropolitan Hilarion met with His Holiness Patriarch Bartholomew of Constantinople who arrived in Athens to attend the conference. They discussed the results of the 5th Pan-Orthodox Pre-Council Conference which completed its work in Chambesy near Geneva on October 17. Metropolitan Hilarion underscored that the Russian Orthodox Church had taken an active part in the process of preparation for the Pan-Orthodox Council and attached great importance to the thorough elaboration of draft documents. The DECR chairman shared with His Holiness Patriarch Bartholomew his profound concern about the situation in Ukraine where schismatics have seized over twenty churches of the canonical Orthodox Church and where there were cases of assassination and violence against clerics of the Ukrainian Orthodox Church. Metropolitan Hilarion said he was perplexed by the actions of bishops of the Ukrainian structures of the Ecumenical Patriarchate in the USA and Canada in support of schismatics. Taking part in the meeting were archimandrite Bartholomew (Samaras), chief secretary of the Holy and Sacred Synod of the Ecumenical Patriarchate; Rev. Dimitry Safonov, head of the DECR section for interreligious contacts, and Rev. Anatoly Churyakov, a DECR interpreter.